Barrel recently helped Blockchain redesign the Blockchain Markets interface used by thousands of people around the world for up-to-date information on Bitcoin and other cryptocurrencies. 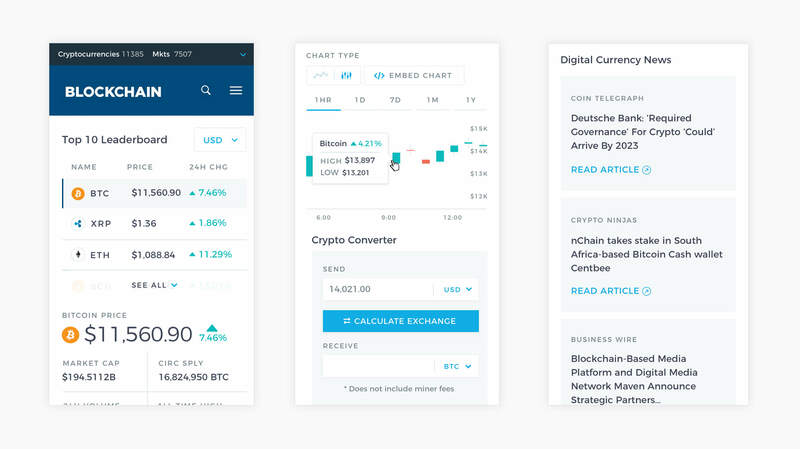 As part of the redesign, Barrel created a new user interface that aligned with the Blockchain Wallet UI, creating a cohesive user experience across their various products. The new Blockchain Markets site introduces a new charting library and cryptocurrency conversion tools to make the content accessible for novices as well as professional audiences. A key recommendation in the redesign was setting up a scalable system that allows the Blockchain Markets site to support multiple cryptocurrencies beyond Bitcoin and be a more useful tool and rank higher in relevant Google searches. The new site also introduced new mobile design considerations to optimize the experience for the large percentage of users visiting the site on their phones. Blockchain is the world’s leading software platform for digital assets. The company offers the largest production blockchain platform in the world, and their software has powered over 100M transactions across 140 countries. Blockchain also offer tools for developers and real time transaction data for users to analyze the digital economy. Check out the site at blockchain.info/markets.